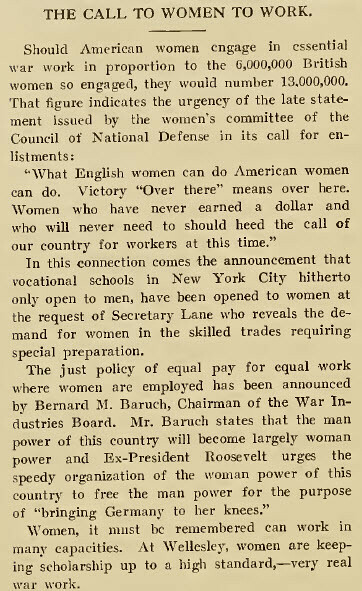 This article in the Wellesley News comes as the U.S. has entered into World War I. What I find fascinating about it though is the openness of paying women the same rate as men. That it is accepted in this instance, nearly 100 years ago, and yet, we still see discrepancies shows that not all victories are long-lasting. It makes me wonder what were the background discussions that made this possible. I'm also curious if the last paragraph is meant to be serious or snarky.